Ice skating in Millennium Park is one of the more popular activities during winter in Chicago. More than 100,000 people are expected to lace up their skates each season and hit the ice in this picturesque environment. Skating season generally begins shortly before Thanksgiving and runs through March. Exact opening and closing dates fluctuate based on weather, so if it's close to the beginning/end of the season check the Millennium Park website to verify if the skating rink is open. Admission to the skating rink is free and open to the public. Skate rental prices begin at $13 (weekday skating) and increase to $15 for weekend and holiday skates. You can also go an hour before the rink opens to the public to join a free ice skating lesson put on by the Department of Cultural Affairs and Special Events. Located in a lovely setting below Chicago's Cloud Gate sculpture—a.k.a. 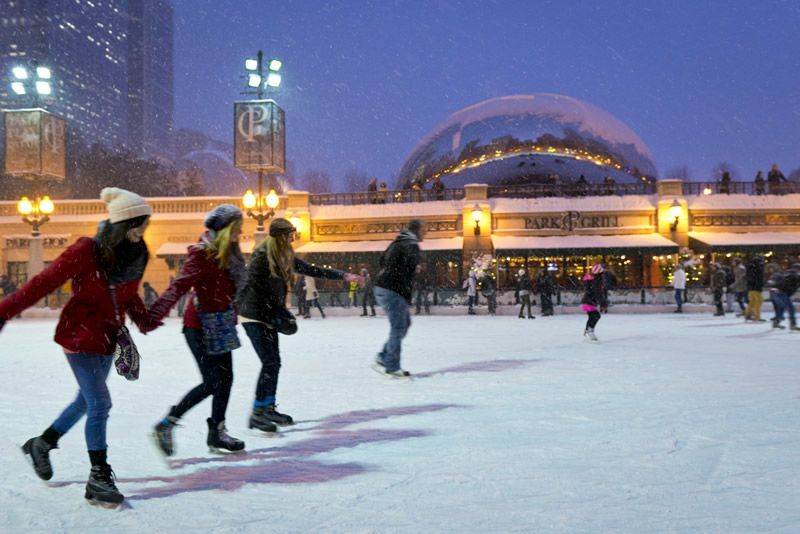 "The Bean"—the Millennium Park ice skating rink is a popular attraction for tourists and locals alike. It's especially beautiful after dark, with the tall buildings to the west, and Cloud Gate reflecting the city lights to the east. Acanto: The Italian-focused eatery is adjacent to The Gage, and specializes in southern Italian cuisine, including hand-crafted pastas, stone-oven pizzas, and artisanal ingredients. It's directly across the street from Millennium Park and less than a block away from the Art Institute of Chicago. Chicago Athletic Association Hotel restaurants: The biggest draws at the hotel, which overlooks Millennium Park, are its dining and drinking establishments–Cindy’s, a rooftop restaurant and bar reminiscent of a Great Lakes beach house; gourmet burger shop Shake Shack, a New York-based chain by famed restaurateur Danny Meyer; Milk Room, an eight-seat micro-bar offering pastries and coffee during the day and high-concept cocktails by night; Game Room, which houses two bocce courts, pool tables, table games, around 300 seats, couches, a 15-seat bar, and bottled Manhattans; Cherry Circle Room, an all-day restaurant that's cocktail focused; and Drawing Room, a second-level eating and drinking establishment. The Gage: A popular after-work watering hole as well as serious dining destination, The Gage cranks out chef-driven, Irish-influenced American fare. Lockwood: The modern restaurant tucked inside the iconic Palmer House Hilton boasts a farm-to-table concept. Seven Lions: Noted master sommelier Alpana Singh opens her second Chicago restaurant, this time downtown within walking distance of Art Institute of Chicago and Millennium Park. The clubby restaurant offers a menu of updated retro fare paired with wine. There's also a special early menu for the theater crowd, served from 4:30 to 6 p.m. It's $39 for three courses and includes a soup of the day and dessert. Tesori: Adjacent to Chicago Symphony Center, the Italian-focused eatery specializes in pastas, pizzas, and pastries made from scratch. It’s a popular destination before and after concerts, and the front room lounge serves as a fine option for Loop workers.